We give you support and training, after which you will be matched with a learner that suits your availability and teaching interests. 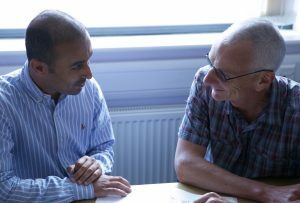 SAVTE staff will already have met and assessed the learner’s English level and needs, and therefore we will be able to advise and support you with your teaching, helping you to tailor your teaching to the learners’ needs. When you teach and for how long will be up to you and your learner to agree. We teach learners from all over the city, which may mean some of your time, will be spent travelling, but we will reimburse your travel expenses.